On energy: It’s expected that 58 percent of Berkshire Hathaway’s energy will come from wind by the end of 2016. The company has committed more than $18 billion to renewable energy. 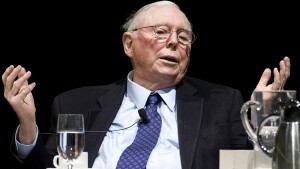 Munger sees renewable energy as a huge benefit to humanity. This entry was posted in Nebraska / Midwest News, NewsBlog and tagged Berkshire Hathaway Energy (BHE), BHE wind & solar development, Charlie Munger, Motley Fool, Nebraskans for Solar, Warren Buffett on May 31, 2015 by Helen Deffenbacher.